My favorite sale of the day is the Suisse design in retro Mad Men sixties office colors. This one is being created on a placemat. 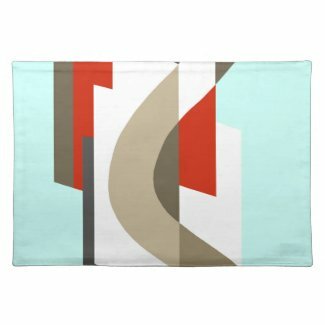 You can see the entire collection of Suisse products at our Zazzle store Art_Deco. And the collection of Suisse products in this color palette, Sixties Office. Boho Nouveau on Electronics Cases has been added to our Zazzle Store, The Case House. Boho Nouveau has a band of Art Nouveau stylized florals and a band of block-print style design, both against a soft tone-on-tone watercolor paper. Available in six tasty palettes: Artistic Aqua, Fashionable Fuchsia, French Blue, Green Scene, Pink Panache and Soft Spring. You will find this design on the following device covers: Casemate iPad, Casemate iPod Touch, Casemate iPhone 4 ID, Speck iPhone 4, Speck iPod Touch, Casemate iPhone 4 Barely There, Casemate iPhone 3 Tough, Casemate Samsung Galaxy, Casemate Blackberry Bold, Speck iPhone 3, Casemate iPhone 3 Barely There and Casemate iPhone 4 Tough. To browse the entire Boho Nouveau collection at The Case House, CLICK HERE. Adalia’s Bling on Electronics Cases has been added to our Zazzle store, The Case House. Flowers, vintage lace, pearls, twinkling fairy lights and sparkling glitter. Who could ask for anything more? This design comes in nine luscious palettes: Kelly Green, Spring Green & Aqua; Peach, Pink & Lilac; Periwinkle & Lilac; Plum & Lilac; Purple & Pink; Rose & Peach; Sky Blue & Lavender; Spring Green & Chartreuse; Turquoise & Sea Green. You will find this design on the following device covers: Casemate iPad, Casemate iPod Touch, Casemate iPhone 4 ID, Speck iPhone 4, Speck iPod Touch, Casemate iPhone 4 Barely There, Casemate iPhone 3 Tough, Casemate Samsung Galaxy, Casemate Blackberry Bold, Speck iPhone 3, Casemate iPhone 3 Barely There and Casemate iPhone 4 Tough. at The Case House, CLICK HERE. Bird on a Branch has been added to The Case House. Bird on a Branch is a colorful and luxurious design from our Faded Splendor collection. In the foreground is a pretty little bird perched on a branch that is adorned with multicolored florals and leaves. The background is a faded grunge, shabby chic style textured rainbow with a round sun against the gradiated colors, and a softly faded splash of Art Nouveau style florals in a ghostly silhouette. Available in six palettes: Artistic Aqua, Fashionable Fuchsia, French Blue, Green Chic, Rainbow Sunset and Sweet Summer. You will find this design on the following device covers: Casemate iPad, Casemate iPod Touch, Casemate iPhone 4 ID, Speck iPhone 4, Speck iPod Touch, Casemate iPhone 4 Barely There, Casemate iPhone 3 Tough, Casemate Samsung Galaxy, Casemate Blackberry Bold, Speck iPhone 3, Casemate iPhone 3 Barely There and Casemate iPhone 4 Tough. This is sooo fabulous! Zazzle now has Playing Cards! See all six color palettes for this design – 1913 Luxe on Zazzle Playing Cards! MAY FLOWER – LOVELY ART DECO FLORAL PILLOWS from Zazzle.com. A large flower with swirling accents in shades of pink, orange, coral, mauve, grape and greens. OVERTURE: MIDNIGHT POSTER from Zazzle.com. A lovely Art Deco composition consisting of simple lines, circles, scallops and pyramid shapes. Overture is available in six interesting color combinations and each color combination can be found on dozens of home and office products, as well as smart phone cases. This version features royal blue, dark and medium purple, turquoise and black. Added to the Case House on 6/22/2012 – Tassels & Roses is an elegant composition featuring large roses attached to multilayered fringed tassels that are also topped with a rose. The background is a faded, shabby chic damask design with a faint metallic-look sheen. Available in six palettes: Elegant Gold, French Blue, Platinum & Silver, Trendy Teal, Victorian Pink and Vintage Mauve.